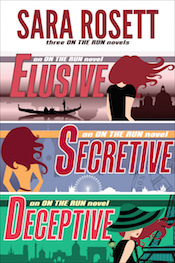 With four hundred 5-star reviews across the first three titles and an average rating of 4.5, the On The Run series is a favorite of mystery readers. Elusive: Zoe Hunter loves living on the edge. Free-spirited and spontaneous, she’s built a life stringing together various freelance gigs that keep her bank account barely in the black. But when her ex, Jack, goes missing along with several million dollars from his business and the FBI zeros in on her as a person of interest, Zoe’s life goes from delightfully unpredictable to downright frightening. Secretive: Zoe Hunter thought all the questions surrounding her ex’s mysterious past had been answered. She couldn’t have been more wrong. This book is bargain priced from 03/14/2016 until 03/20/2016.